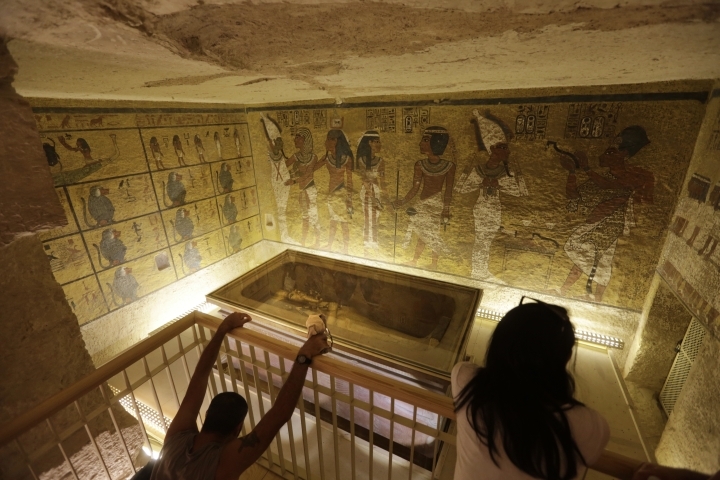 LUXOR, Egypt — The tomb of Egypt's famed boy pharaoh Tutankhamun has undergone restoration to help minimize damage by tourists. The work, done by the Getty Conservation Institute after years of research and officially presented Thursday, aims to minimize scratches, dust damage and microbiological growth from breath and humidity brought in by tourists. The nearly intact tomb of King Tut, who ruled Egypt more than 3,000 years ago, was discovered in 1922 by Howard Carter in the Valley of the Kings, located on the west bank of the Nile River in Luxor. For many, King Tut embodies ancient Egypt's glory, because his tomb was packed with the glittering wealth of the 18th Dynasty, which ruled from 1569 to 1315 B.C.